If working in the healthcare sector, and we are, there are responsibilities that go with this privilege. To focus on the LONG TERM best health benefits of clients, to promote the uptake of progressive safe, appropriate exercise/rehabilitation/ treatment, to educate, and identify, optimum, health nourishing foods, and a willingness to liaise with other healthcare providers who will provide further expert knowledge, specific to any client when necessary. These, along with continuous education, and indeed re-educating on safety, and emergency procedures, plus, keeping a keen interest in what the latest scientific technology has to offer, are the foundations of our responsibility to you as a potential client. If, you are a professional bus “misser,” this, because you simply can’t run to catch the bus, before it pulls away, if you are preparing to run a marathon in a personal best time, if you have finally come to understand that you have not simply arrived at a location called “overweight” but that, you are on a horror journey of “continuous” weight gain, or maybe, you are simply tired, of being tired. Whether 100 years, or 18 years, male or female, you qualify to avail of our expertise. 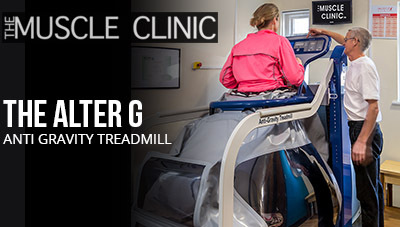 With a lot of care, and a touch of fun, we can take you through any fitness programme, The Muscle Clinic has also invested in equipment not to be found as a matter of course in training/ treatment facilities, the Alter G anti-gravity, the recently acquired Bionic leg, Frequency Specific Microcurrent ,Laser postural assessment, thermal imaging, Far- infrared sauna ,hydraulic rehabilitating chair all add to the variety to be experienced. We, are qualified to meet your requirements, and you qualify to meet us. 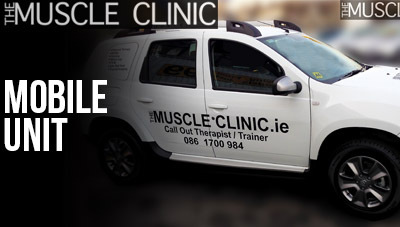 Looking forward to seeing you at The Muscle Clinic.